Technically, this is the announcement of a future announcement, but we'll let it slide because it's about time we had some insight into what to expect from Blizzard next set of wizard poker cards. We're told big news will be made at the Hearthstone Winter Championship taking place next weekend. 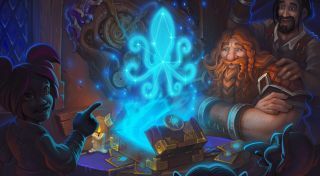 Lead Designer Ben Brode and Senior Producer Yong Woo will make a special announcement about what's next—which presumably means details of the next card set, due to go live alongside the upcoming Standard format sometime in spring. The Americas Winter Championship, the first of three Winter Championship weekends that will be held in March, begins at 10 am PST on March 11 and runs through March 13. The European Winter Championship will follow on the March 18-20 weekend, beginning at 5 am PST (2 pm CET), while the Asia-Pacific Winter Championship will run March 24-26, with a 9 pm PST (14:00 KST) start time. Catch it all—the announcement and the action—on the Hearthstone Twitch channel.